Mikhail Bakunin (1814–1876) was a Russian anarchist and revolutionary who was active in Europe from 1840 to 1849, and 1861 to 1871. During the years between these periods, he was imprisoned in both Europe and Russia, and for a time was exiled to Siberia. His views are held to be contradictory because he believed both that the “instinct for freedom” in the masses would lead to revolution and that revolution would need to be the result of a plan by educated elite. In his first period, Bakunin criticized liberal projects to reconcile the demands of workers with the establishment, and he was particularly excoriating about both the Church and the state. In his second period, he attacked scientism, or the dominance of technical approaches to public policy, calling for a “revolt of life against science.” Overall, Bakunin and his followers were opposed to the development of Marxism. 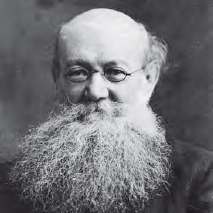 Peter Kropotkin was a Russian prince whose views on communism were mitigated by science and the ideas of evolutionary theory (Art Archive).